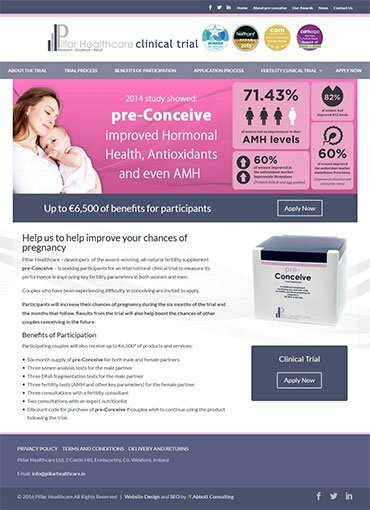 Pillar Healthcare Clinical Trial – Pillar Healthcare, based in Co Wexford developers and manufacturers of the ground-breaking and all-natural fertility nutrition supplement, pre-Conceive – were already satisfied clients of New World Digital as we had built them an e-commerce site to showcase their product and its benefits, and allow it to be ordered online. As part of ongoing research and development, Pillar Healthcare received approval and funding for a major international clinical study into the benefits of pre-Conceive, and how it improves key fertility levels in both women and men. They wanted a dedicated site to announce the trial and to seek volunteers to take part, and they came to use again. We were delighted to oblige. Through negotiation with the client, we first established the scope of the planned study itself, and determined the exact specifics of what the website would have to achieve. It was immediately obvious that content would be even more crucial than normal to this build. We faced a dual challenge: firstly, to inform people who may not have previously heard of pre-Conceive about what it is and how it works, and secondly, to encourage people to participate in the trial, despite how that would involve sharing what would normally be seen as highly personal information. We achieved this through further detailed discussion with the client. Several drafts of content were carefully reviewed and amended until we arrived at the perfect combination of scientific and clinical information on one hand, to portray the standing and professionalism of Pillar Healthcare, but ‘human’ language on the other hand, to speak in more everyday terms to couples experiencing the emotional turmoil of having difficulty in having a baby. A key element to this was assuring couples who might volunteer that all evidence to date suggested they would have a better chance of conceiving if they used pre-Conceive regularly, but at the same time, not making false promises or raising their hopes unrealistically high. The attention that the content required for this project shows the benefit of New World Digital having our own specialist and vastly experienced content writer – a service that many other digital marketing and website design agencies do not offer. The website was styled to match the main Pillar Healthcare website, with some modifications to allow for how added functionality required would slow down loading speed if all styling points were replicated. The content is laid out in a logical and easy-to-follow manner, with several call-to-action buttons, and obvious detailing of all the benefits a couple would stand to receive if accepted for the trial. Particular emphasis had to be placed on the application form. The trial is for couples, so this form was split into two columns (one for male, one for female). These columns are styled using colours based on the Pillar Healthcare branding. Parts of the form seeking details in respect to answering yes to certain questions are only show when appropriate. A file upload facility is also provided for participants to upload test results and other documentation. All the information is stored in a database and is accessible with private log-in by authorised clinical trial staff at Pillar Health. These private pages are styled and presented in a similar manner to the main trial application form and all data can also be exported to spreadsheet. Overall, the site meets all its aims, and it was launched to coincide with the international launch of the clinical trial itself. A digital marketing campaign was then also launched to bring it to the attention of people in all eligible countries. Visit Pillar Healthcare Clinical Trial to see the results of our work. Evolv Health & Wellbeing Store in Enniscorthy, Co. Wexford, is one of Ireland’s largest shops of its type – operating over three floors of retail space, and offering a number of treatment and therapy rooms too. Since its foundation in 2006, husband and wife team Matt and Nuala Ronan have built up a loyal customer base from throughout the south-east and further afield, and a reputation for unrivalled knowledge on nutrition, natural remedies, and holistic and alternative medicine. They are passionate about all those topics themselves, and that passion shines through in their business. They felt that an existing website built by another agency did not do their store justice, and that the time was right for a complete overhaul and re-build. They were impressed by our other work – so they gave us a call too. Our initial meeting with Evolv showed us just how extensive the Evolv business really is, and how careful consideration would need to be given to the menu structure of the website, simply because there would be so much to portray. We established all the main topics to be covered for the retail space (nutrition, natural cosmetics, gift shop, etc. ), and also decided upon a strategy for detailing the eleven forms of treatments and therapies also available there (hypnotherapy, reiki, reflexology, etc.). Our senior copywriter then spoke to the clients to get all the details required. He drafted engaging and keyword-optimised content with several calls to action, and once it was approved by the clients, we progressed to the website design and build. Our senior developer and designer was assigned to this project and he immediately felt that given the nature of the business and how it promotes health and wellbeing, the website should have a vibrant and dynamic feel in terms of layout, colour scheme, imagery, etc. 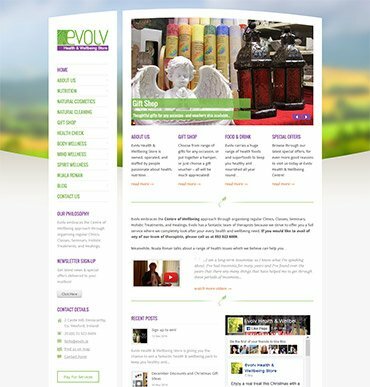 He created a visually-appealing backdrop, left sidebar, and main content panel to deliver those results, and used the green and purple of the Evolv logo throughout to bring a consistency and freshness to the design. Little touches such as images of leaves to break up passages of text give an added impression of natural goodness as a user surveys the site. Flexible framework, preconfigured to allow implementation of additional functionality if requested (ecommerce, products showcase, etc). We were delighted with the results ourselves, and were excited to show the site to our clients. We look forward to working with Evolv on an ongoing basis, as they have also engaged us to deliver ongoing digital marketing services. Pillar Healthcare is a ground-breaking company founded in Enniscorthy, Co. Wexford, as recently as 2012, and now operating internationally. 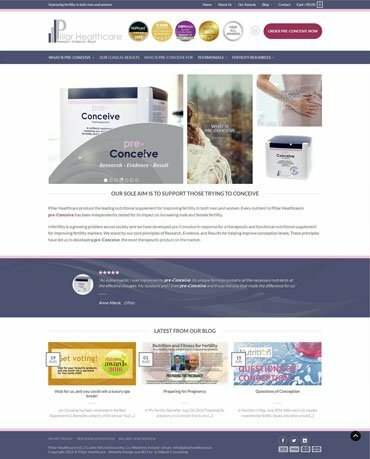 They are the developers and producers of pre-Conceive, an innovative and all-natural fertility nutritional supplement for couples who are having difficulty in conceiving. It has already been nominated for several prestigious industry awards, and was the subject of Europe’s first independent clinical study into a fertility supplement. During 2016, in advance of a second and much larger study, Pillar Healthcare’s managing director Mark Whitney decided the time was right for a thorough re-build of an existing website. He engaged us to do it. We conducted a comprehensive audit of the existing website, and outlined our proposals for how it could be improved. We saw this would involve extensive copy editing and re-writing, to make highly scientific information more accessible to the target audience, as well as an overhaul of menu structure and general design to improve the user experience. Keyword research and traffic analysis also allowed us to fully compose a plan for an effective online strategy. Once actions were agreed upon with Pillar Healthcare, our senior copywriter began work, creating content with effective marketing messages while remaining SEO-friendly. Key considerations here included addressing concerns that prospective customers may have about the product – primarily its price (significantly more expensive than other off-the-shelf supplements, but still more cost effective than buying such large doses of its ingredients individually) and its taste (which many find off-putting, but which can be improved upon by following simple steps). We also focussed on graphics and other images – a combination of existing ones, and new ones drafted specifically for the project. Once all content was agreed, our senior designer/developer got to work. Our designer first tailored an attractive page template, with each page displaying a clear Call To Action alongside its other relevant content. Images were used appropriately throughout, and great attention was paid to the overall user experience of the front end, to ensure the new website design would be easy to navigate. Extensive on-page and off-page SEO measures were taken at all stages, while e-Commerce functionality was improved upon too, all the while with regard to the client’s requirements. Our combination of implementing modern design and user friendliness solutions, along with attention to detail and client liaison throughout the build, proved a real winner with the client – as you can see from comments below. Following the site’s launch, Pillar Healthcare agreed a full digital marketing package for the months and years ahead, and we look forward to continuing to enjoy working with them.